2018 Top 50 True Freshman OL’s and their Impact on the Season. Let us continue on the Top 50 true freshman list today with the offensive line. Here we will measure their impact on the season with how many games they started this past year. On my 2018 Top 50 offensive lineman list only 8 (16%) players had at least 1 start on the season. Out of the 8 players only 3 were in my Top 10. Of the Top 50 only 26 (52%) played in at least 1 game last year. No player started every game for their team and 1 player played in every game. Let’s look at the only 4 players that started in at least 7 games. PS#44 Daniel Faalele of Minnesota started in 8 games and was voted teams co-outstanding offensive Frosh. PS#3 Cade Mays of Georgia started 7 games. Oregon’s Penei Sewell (PS#5) started in 7 games injured for 6 and still received HM PAC-12 honors. 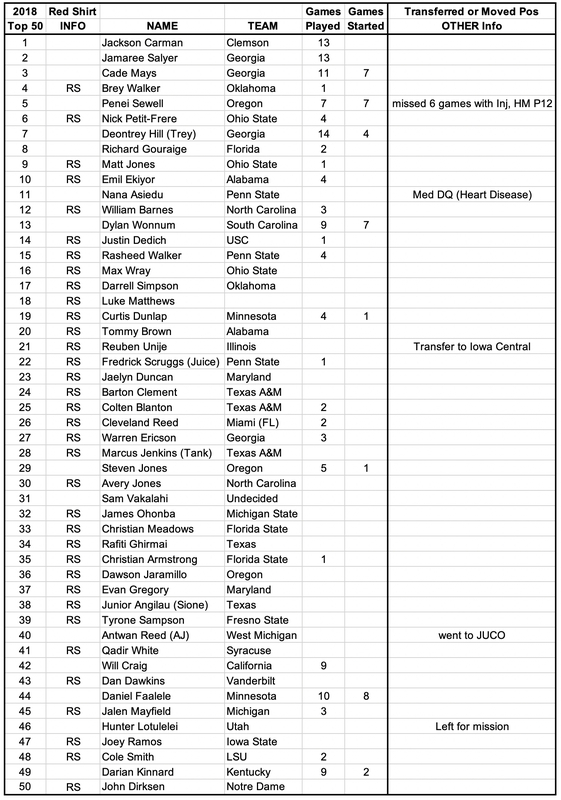 Here is the complete list on the Top 50 true freshman offensive linemen from last year. Top 50 True Frosh OL’s for 2019. On Wednesday we will take a look at the Top 50 true freshman defensive linemen.